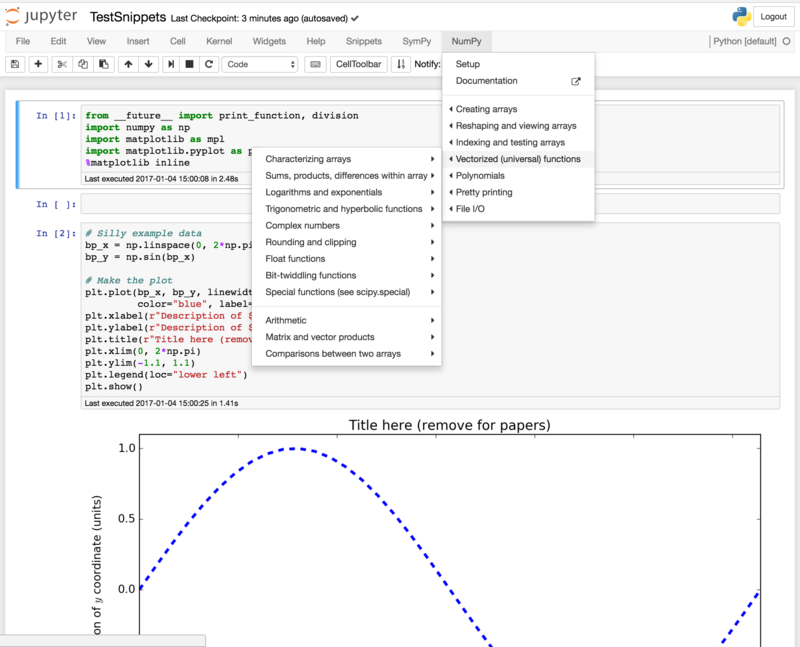 Adds a customizable menu item to Jupyter notebooks to insert snippets, boilerplate, and examples of code. 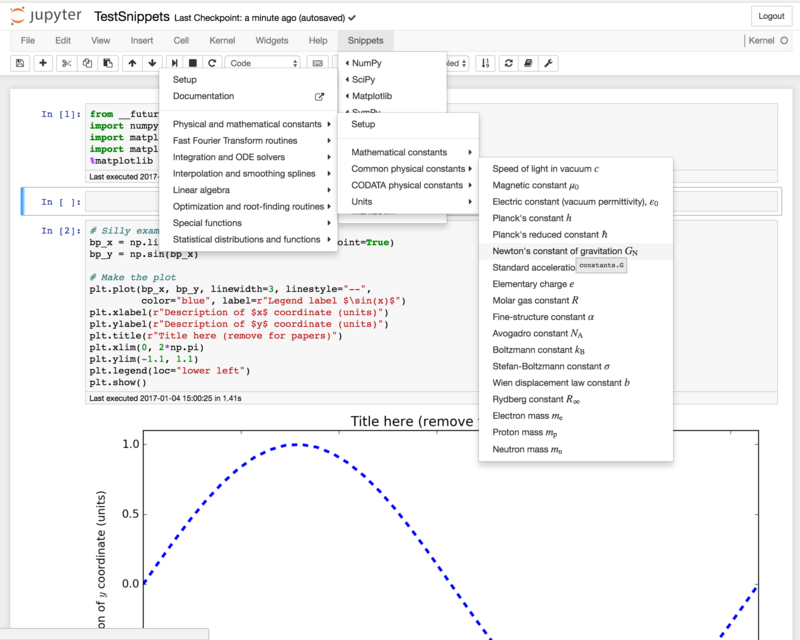 This notebook extension adds a menu item (or multiple menu items, if desired) after the Help menu in Jupyter notebooks. This new menu contains little snippets of code that we all forget from time to time but don’t want to google, or are just too lazy to type, or simply didn’t know about. It can also be helpful for people just starting out with a programming language, who need some ideas for what to do next — like importing a module, defining variables, or calling functions. The inserted text will be selected, so that you can delete it by pressing backspace or delete, or you can just select another snippet to replace it – and just to highlight what was inserted. Note that many of the snippets involve variable names prefixed with bp_. For example, a new numpy array is created as bp_new_array. These are intentionally dumb names that you really should replace. Failing to do so could lead to ugly bugs in your code if you use multiple boilerplate snippets with clashing variable names. Similarly, some strings are intended to be replaced, such as the axis labels in plots. These are there to show you what can be done, and to remind you to put informative labels in your plots. If you don’t want, e.g., a title on your plot, just remove that line. The default menu might have too many irrelevant items for you, or may not have something you would find useful. You can easily customize it in the jupyter_nbextensions_configurator, which you almost certainly have if you installed this extension the normal way, through jupyter_contrib_nbextensions. Usually, you can get to the configurator by pointing your browser to http://127.0.0.1:8888/nbextensions, though you may have to modify the URL if you use a more complicated jupyter server. On the configurator page, you will see a number of options (as well as this README) that should be fairly self-explanatory, allowing you to remove any of the default menu items, or add a custom menu within the “Snippets” menu. The custom menu is written in JSON, and a simple (and useless) example is given that should be easy to modify as needed. It is also possible to extensively customize the menus in far more complex ways using your custom.js file. For example, you can change the order of menu items, add more custom sub-menus under the “Snippets” menu, and custom menus alongside “Snippets” in the menu bar, or even add menus in other places, like inside the “Insert” menu. For Mac and linux users, the result is probably ~/.jupyter/custom/custom.js. If this file or the directory containing it do not exist, you can simply create them. The customization process is best explained through examples, which are available in the examples_for_custom.js file in this directory. Note that there’s a lot of explanation here, but it’s all actually pretty simple. Give it a try, and you’ll pick it up quickly. Note that using this method can make it so that options selected in the configurator are ignored. Again, this makes more sense when looking at example, as follows. Now, if you refresh your notebook, you’ll see a new menu item named “My favorites”. Hover over it, and it will pop up a sub-menu with two more options. Click the first one, and it will insert new_command(3.14) into your notebook wherever the cursor was. We discuss how all this works below. But first, we need to slightly generalize the example above to work with more complicated snippets. Quotation marks can be a tiny bit tricky. There are a few options: 1. The obvious option is to enclose your snippets in single quotation marks ('), and use only double quotation marks (") within the snippet itself. 2. Just as easy is to enclose your snippets in double quotation marks ("), and use only single quotation marks (') within the snippet itself. 3. You can also escape single quotation marks inside single quotation marks as \'. Newlines are even trickier, but the extension takes care of this for you as long as you put separate lines of code as separate elements of the snippet array. Generally, there’s no reason to put a literal newline in your snippets. Note the code output by the first item contains all sorts of interesting strings. Also, the menu title of the second item contains TeX, which will display correctly, and is used in some of the default menus to show the standard symbols for physical constants. For more examples, look at the default menus stored in the snippets_menu directory – mostly under python. name: Text that appears in the menu. Note that this can include latex, as the menus are processed by MathJax after being loaded. internal-link: Link to some place on the present page. For example, this could be #References, to link to the References section of any notebook you’re in. external-link: This just a link to some external web page, which will be identified with a little icon, just like in the standard notebook “Help” menu. When clicked, the link will open in a new window/tab. menu-direction: If the value of this property is left, this menu’s sub-menus open on the left. This is useful when the top-level menu is inserted as an item within other menu items. See below for examples. sub-menu-direction: If the value of this property is left, sub-menus within this menu’s sub-menus open on the left. This is used by default for items under the Snippets menu to help ensure that nested menus don’t become too large to fit on the screen. See below for examples. The name property is the only required one, though you’ll probably want at least one other property. The sub-menu contains menu objects that again may have any of these properties, so you can easily nest menus. You can also combine a snippet with a sub-menu, so that there’s a default value as well as a sub-menu. However, the last three are mutually exclusive: snippet will override any -link; an internal-link will override an external-link. This might be useful if you have one set of very frequently used commands, and want immediate access, without going through various levels of the usual menu. A useful example of this is shown below. The splice function can also be used to delete items from the array, as described next. The first 1 in the argument to splice says to work on the element at position 1; the second 1 says to delete 1 element of the array. Each sub-menu may be placed to the right or left side of the menu item containing it. This is controlled by the menu-direction and sub-menu-direction properties of the container. By default, both are set to right for all menus, but sub-menu-direction is set to left for the default Snippets menu, which means that all of its sub-menus open to the left side. This is important because the menus may be nested quite deeply, and need to fit on the screen. For example, the SciPy CODATA constants and SymPy’s orthogonal functions will easily extend far past the right-hand edge of the notebook without this feature. That means the window size would abruptly increase when you mouse over these menus, and would abruptly collapse when you mouse out of them. So by opening them to the left, we gain enough space to keep everything on the screen. This may be particularly useful if we change the position of the menus, as in the next examples. The default menu group is snippets_menu.default_menus, and the SymPy sub-menu is snippets_menu.python.sympy. You can see that we’ve manipulated them above by removing two elements from the default menu, using the splice command. We’ve also added a new property to the SymPy menu to make its sub-menus open to the left, instead of the right – which is necessary to keep all of SymPy’s extensively nested menus on the screen. (In fact, the list of orthogonal polynomials under “Special functions” in the SymPy menu are some of the widest menus in the default set.) Finally, we’ve combined the modified default menu with the modified SymPy menu into one new list. You can see that the two items are indeed removed from Snippets, and “SymPy” and “Numpy” now have places of honor right in the menu bar. You can, of course, swap their order in the code above, or make any number of further alterations. You might want to change the order of the menus in the navbar (that top-level bar with “File”, etc.). For example, it might feel particularly natural to have “Help” as the last item, so maybe you’d prefer to put the Snippets menu before the “Help” menu. Or you may prefer to maintain the structure of the menus in the navbar, and would rather have the Snippets menu inside of some other top-level menu – like the “Insert” menu. Personally, I prefer to have the Snippets menu in its default position for easy access. But it’s certainly possible to put it other places. sibling: This is an HTML node next to our new menu, presumably selected with jQuery. The default value is $("#help_menu").parent(), which is the “Help” menu. For the configurator, .parent() is automatically appended. insert_before_sibling: This is just a string controlling where the new menu will be inserted relative to its sibling. The default value is false. If you change it to true, the new menu will be inserted before the sibling. snippets_menu.default_menus['sub-menu-direction'] = 'right'; // ...and sub-menus to the right. And of course, you can combine this selection of the insertion point with other techniques above, where you change the content of the menus. Finally, we have one more interesting example that brings together various threads from the previous examples. It is possible to place multiple menus in different locations. For example, suppose we want to combine two of the examples above, where (1) we separated “SymPy” into its own menu on the navbar, and (2) we placed the Snippets menu inside the “Insert” menu. That is, you might want “SymPy” to be conveniently placed, but you want the rest of the Snippets to stay under the “Insert” menu. Clear your browser cache or start a private browser tab. Verify your custom.js is the one the notebook is seeing, by opening it in the browser: http://127.0.0.1:8888/static/custom/custom.js (as opposed to looking at the file directly outside of your browser, which may not be the custom.js loaded if you are using a virtualenv). Or maybe the menu did appear, but it doesn’t work properly. You can also inspect the actual elements that were inserted. Click on “Elements” in that Developer Tools tab that opened at the bottom of your window. Then click the magnifying glass, and click on the Snippets menu. This will jump the Developer Tools to the part of the source with that menu. Scroll through to find the menu item that’s not working correctly, and take a look at it. The text in the data-snippet-code attribute is especially important, since that’s what gets inserted into the notebook. There’s a bunch of stuff I still need to do, listed in the issue tracker. If you find a bug or have an idea for a good snippet that you think should be added to the defaults, feel free to open a new issue. In particular, I don’t use Julia or R, so I welcome suggestions for default snippets for those languages. Introducing beginners to coding. It’s helpful for the beginner to have a list of useful possibilities (with correct syntax!) lined up right where the programming is happening. It’s like “Hello world” on steroids. 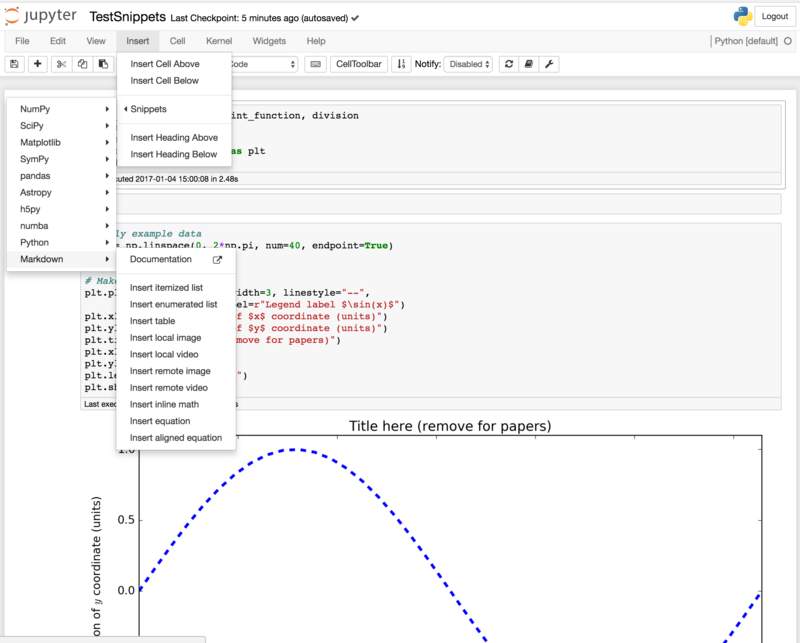 Introducing the Jupyter notebook. It can be useful to have some nice things to do in the notebook to demonstrate the possibilities. For example, you might suggest that someone new to the notebook run the Matplotlib setup and then make an example plot. Convenience for lazy people like me. For example, I usually don’t want to bother with all the typing involved in setting up the nice (but important) parts of a plot, like the axis labels and legend. But by inserting the template, all I have to do is change the relevant values. Reminders about useful things that could be done. For example, when I’m manipulating expressions in SymPy, I’ll frequently forget that I can simplify, expand, collect, etc., in all sorts of ways. The Snippets menu reminds me of that. Convenient reference for massive libraries. For example, SciPy contains lots of constants. You could certainly go to the web page describing these various constants to find the one you need, or you could just explore them right in the browser. The same is true of SymPy’s collection of special functions. © Copyright 2015-2018, Jupyter Contrib Team. Revision 03109e43.